The next time you’re on Maui, make sure you check out the beautiful new art at the South Shore Tiki Lounge in Kihei. Artists Christine Benjamin and Woody Miller have each painted a scene on a center board for a table on the outdoor patio. 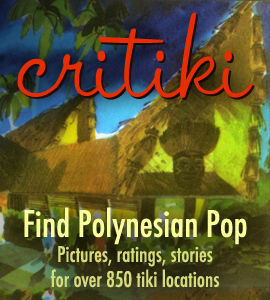 Christine and Woody are both San Francisco Bay Area-based artists, and make regular visits to Maui to visit their good friends, Kihei-based tikiphile/artists Scott Taylor and Rob Hawes. The four, and their families, spend time together on Maui often. While you’re there, don’t miss Scott’s store, Beach Bumz, just a stone’s throw away from South Shore Tiki Lounge. It’s a small but jam-packed stall in a nearby shopping center, full of tiki mugs for sale, including gorgeous ones made right on Maui by himself and Rob.